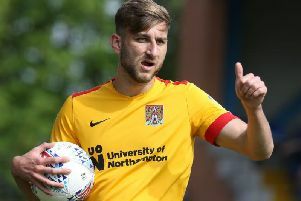 Cobblers boss Chris Wilder has explained his reasoning behind his decision to release experienced duo Ben Tozer and Darren Carter. And he was also quick to highlight the pair’s ‘outstanding attitude’ during his time as manager. Utility player Tozer was the longest serving player in the Town squad, having made his debut as a loan player from Newcastle United in that famous Carling Cup win at Anfield against Liverpool in September, 2010. The 25-year-old went on to become a first-team regular under Ian Sampson, Aidy Boothroyd and Gary Johnson, with his long throw a particularly potent weapon under Boothroyd as the club reached Wembley in the play-offs in 2013. Tozer has gradually found games harder to come by under Chris Wilder, and although he did still make 28 appearances this season, he hasn’t started a game since December 26 last year. Wilder is a fan of the player’s versatility, especially from the bench, but he also revealed that the player was one of the best contracts at the club, and that he simply couldn’t justify keeping him on. “Ben is on an excellent contract which he had when I first came into the club, and he deserved that under the old manager,” said Wilder. “Ben is another one who has struggled to get games due to the form of Brendan Moloney, who has been outstanding for the majority of the time since January, and I can’t afford to carry two right-backs, especially on the wages that we have to pay for both of them. “Ben is another player with an outstanding attitude, and we could have possibly offered him something to keep him in and around the building, as a cover right-back, he can play centre midfield at a push, he can play right centre-half. “But as I say, do I see Ben getting in ahead of Ryan Cresswell or Zander Diamond? No. “Do I see him getting in ahead of Jason Taylor in the middle of the park, and manybe another target we are looking to bring in? No. “I also see Brendan Moloney played regular first-team football, and that’s how it is. “It is another tough decision, and Ben, at this stage of his career, would possibly want to go and play regular first-team football somewhere else. In total, Tozer made exactly 200 appearances for the Cobblers, with 176 of them starts, and he netted seven goals. Midfielder Carter is another player that has found himself on the sidelines more than in the team this season, with the acquisitions of Jason Taylor and Joel Byrom in the central midfield area limiting his opportunities. The former Birmingham City and West Bromwich Albion man was the club’s supporters player of the year in 2014, after his strong performances helped keep the club in the Football League, but he has not been able to have anywhere near the same influence this term. “Darren has not played any football all season,” said Wilder. “When I came into the club he was outstanding in the second part of the season. “He then had an injury at the start of this season, and maybe he hasn’t recaptured the form he showed when I first got walked through the door. “Darren wants to play first-team football, and I understand that at his age, so even if I did possibly offer him a contract, he might have turned it down. “He hasn’t played a lot of football. Darren has been in the 18 on matchday and his attitude has been outstanding, he has gone on the pitch when called on, and has always put a stint in. “But we feel with Joel Byrom in there, the partnership between him and Jason Taylor has been outstanding, so Darren finds himself on the outside. Carter was signed by Boothroyd after he left Cheltenham Town in the summer of 2013. He made 53 starts for the Cobblers and 12 substitute appearances, scoring six goals.